Scott Weisenberger offers his customers much more than just freshly baked goodies at Sisters McMullen Cupcake Corner at 1 Pack Square in downtown Asheville. He’s more like an Ambassador to the city for the countless visitors who can’t resist stopping in after peering in the window and seeing the colorful display of pastries. A young couple open the door and Scott gives them his biggest smile and a warm greeting. Their eyes light up at all the goodies. ” Take your time” he says. “There’s no rush. If you have any questions, feel free to ask.” It doesn’t take them long to make their decision, pay for their cookies and start munching! When Scott sees me coming through the door, he knows to start packing up a few black and white cookies. 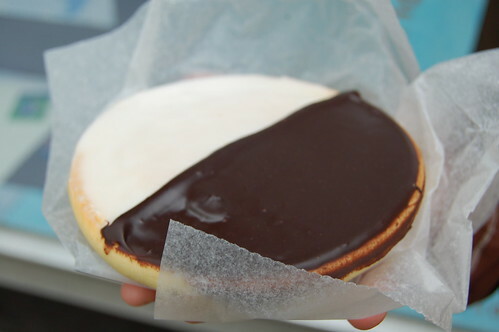 For years, I searched all over Asheville for black and white cookies that resembled the ones from my Father’s restaurant (Wolfies) in South Florida. It’s like having a little bit of “home” each time I take a delicious bite! 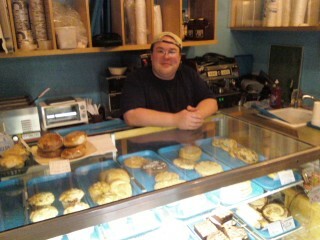 Thanks to Scott Weisenberger, stopping in for my cookie “fix” is (as always) one of the nicest experiences of my week!